Surveys by the Mars Global Surveyor, MOC instrument revealed evidence of liquid water "spurts" in this location in 2005. Evidence from the Mars Global Surveyor MOC instrument that spurts of liquid water may sporadically flow on the Terra Sirenum region. Close-up view of concentric crater fill, as seen by HiRISE Note: this is an enlargement of previous image of a concentric crater. Surface showing appearance with and without mantle covering Mantle contains ice. An oxblow lake forms when a channel forms a short cut across a meander. The presence of an oxbow lake means that water flowed long enough to erode a meander before a cutoff was formed. Terra Sirenum is the location of many Martian gullies that may be due to recent flowing water. Some are found in the Gorgonum Chaos  and in many craters near the large craters Copernicus and Newton Crater. Gullies occur on steep slopes, especially on the walls of craters. Gullies are believed to be relatively young because they have few, if any craters. Usually, each gully has an alcove, channel, and apron. 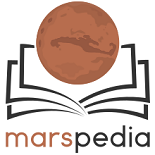 Many theories have been proposed for the origin of gullies on Mars. Many involve flowing water. However, with more repeated observations it was found that gullies could form today when pieces of dry ice go down steep slopes. Furthermore, experiments on the Earth can duplicate gullies with pieces of dry ice moving down slopes. In the distant past some water may have been involved with some gullies. ↑ Levy, J. et al. 2009. 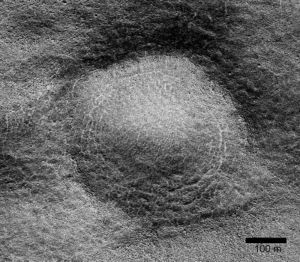 Concentric crater fill in Utopia Planitia: History and interaction between glacial "brain terrain" and periglacial processes. Icarus: 202. 462-476. ↑ Harrington, J.D. ; Webster, Guy (July 10, 2014). "RELEASE 14-191 – NASA Spacecraft Observes Further Evidence of Dry Ice Gullies on Mars". 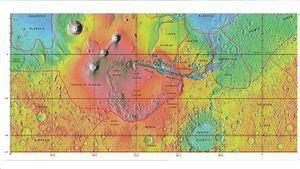 Location of Terra Sirenum (Google Mars). Images of suspected gullies in Terra Sirenum. This page was last edited on 24 July 2018, at 12:42.